ACCESS The airport is at Jubbar-Hatti, 23 km away. Shimla is connected to Kalka by an enenchanting narrow gauge railway line where even a quaint rail car ply. By road, Chandigarh is 117 km, Manali is 280 km, Chail is 45 km and Delhi is at a distance of 370 km. From Delhi, Manali and Chandigarh, luxury coaches and taxis ply to Shimla. During tourist season HPTDC also operates regular deluxe buses from Delhi and Manali to Shimla. CLIMATE In winter, the temperature can drop below freezing point when heavy woolens are required. Summer temperature are mild and light woolens/cottons are recommended. ST. MICHAEL’S CATHEDRAL: This dressed-stone church with fine stained glass has a cruciform design. It is located just off the Mall, below the District Courts. JOHNNIE’S WAX MUSEUM : The museum feature life-size wax statues of popular personalities from various fields, such as Hollywood, Bollywood, Politicians, Sports etc, like Madame Tussauds, London – the most famous wax museum in the world. 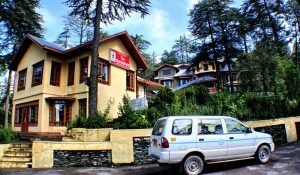 The Museum is located HPTDC Lift, The Mall, Shimla. KALI BARI TEMPLE : The famous Kalibari Temple of Shimla is a popular tourist attraction and is situated at a very strategic location. The temple was built in the year 1845 and is dedicated to Goddess Kali who is also known as Shyamala. It is from the name of Goddess Shyamala that Shimla derives its name. JAKHOO TEMPLE : It is situated on Jakhoo Hill, 2.5 km from the Ridge, Shimla at a height of 2,455 m (8,000 feet) above sea level. It is situated at highest peak of Shimla and offers a panoramic view of the Shivalik Ranges. SHREE TIRUPATI BALAJI TEMPLE: Masterpiece of architecture and carving marble, this temple is locate at Longwood which is at a distance of 1.5 KM from Mall Road. The temple and Satsang hall has been tastefully decorated for the visitors for relaxing.